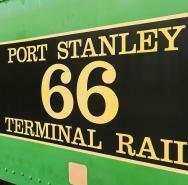 Climb Aboard and ride the rails on the Port Stanley Terminal Rail (PSTR)! Located in the quaint village of Port Stanley, the PSTR travels over the tracks and rail bed of one of Ontario’s oldest railways, the London and Port Stanley Railway (L&PS). Ride the train with Stanley the PSTR Bear, enjoy one of several special events including musical entertainment, murder mysteries, and holiday themed rides, or rent out the “Little Red Caboose” for a private party with all of your friends!